While it shows up in The 5 Totally Useless Statements You See in Every RPG Discussion, we still can't seem to stop ourselves from talking about historical accuracy. Hell, I've fallen prey to those moments, like when I wrote articles about how the word swashbuckler referred to an unskilled, brutish swordsman, or about how rapiers were made popular partially because of guns becoming more common. Don't get me wrong, these conversations can sometimes go to interesting places. The discussion of how useless armor that bares your mid-rift is, for example, is one that I never get tired of joining in on. However, the next time someone tries to tell you that your spiked plate mail, engraved with skulls and howling demons, would never have been worn in battle, you might want to direct them here. The folks over at i09 have never been shy about bringing up unusual, mostly forgotten facts about history. This article about The Weirdest and Fiercest Helmets From The Age of Armored Combat is just what you'd expect them to come up with. Look at this goddamn thing! That helmet is called the Toothface Helm, and it was made by an unknown Italian artist in the 17th century. Sure, it looks like something you'd wear in a tournament, but the point is this wasn't a decorative piece of equipment. Someone actually strapped that thing on, mounted up, and bore down on an opponent with their head inside that terrifying steel visage. The Toothface isn't the only example in the collection i09 dug up, either. 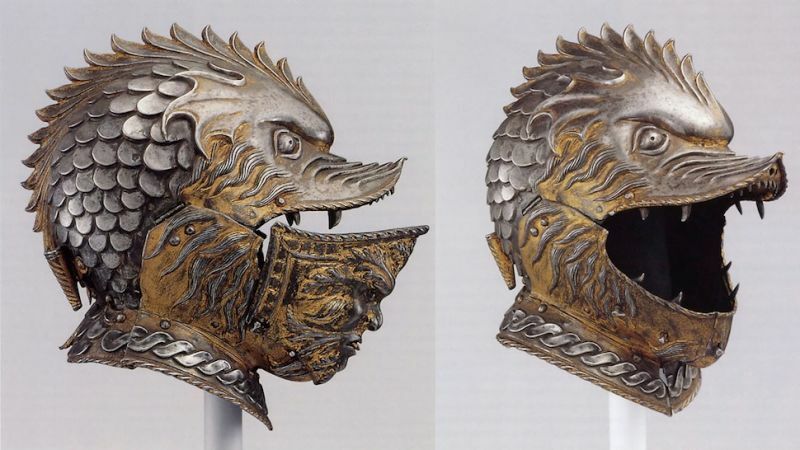 There are helmet shells (which were meant to be worn over a plain helmet to make them look fierce or frightening, but which would likely smash under an attack) in the shape of lion head, a sallet helm oil painted with the face of a toothed beast, and half a dozen other unusual, bizarre pieces. So, the next time you're debating whether or not to go into the elaborate description of your fighter's helm, which bears the roaring beast of his family's noble crest, don't worry that you're breaking some unspoken rule. First of all, if it fits your fantasy world, there's nothing wrong. Second, if you need reassurance that actual history wore similarly elaborate head cases to mark out wearers and terrify enemies, then i09 has your back. Also, check out this rapier hidden inside a snake bracelet, or this actual iron hand worn by a Renaissance-era German mercenary, if you want more cool ideas for your next game plucked from the pages of history! To keep up on all my posts, make sure you follow me on Facebook, Tumblr, and Twitter. If you'd like to help support Improved Initiative, and earn some sweet holiday swag, then go to my Patreon page to become a patron today! As little as $1 a month can make a big difference.